West’s haste to engage with Turkmenistan and buy its gas risks sweeping human rights under the carpet, activists say. When Turkmenistan began opening up to the outside world following the death of President Saparmurat Niazov three years ago, the theory was that increased economic engagement by western states would encourage a more general relaxation of policy in such areas as human rights and political liberties. When he was elected in 2007, the new president Gurbanguly Berdymuhammedov held out the prospect of a break with the country’s repressive past, and promised to open up the country, not just by engaging with foreign investors but also by allowing access to information, freedom to travel abroad, and other improvements. Since then, Berdymuhammedov has launched some reforms in education, healthcare and the arts, in the main to reverse some of Niazov’s more catastrophic policies. However, when it comes to fundamental civil rights and liberties, the consensus among Turkmen human rights defenders is that little or nothing has changed, and western governments are fooling themselves if they take minor concessions as a sign of goodwill. Rights experts believe President Berdymuhammedov is dangling the prospect of gas industry contracts in front of western states and company in the hope they will pass over human rights abuses in silence – and they fear that the latter are taking the bait. “Commercial energy interests seem to have won out, and no one is paying any attention to rights,” commented Vyacheslav Mamedov, head of the Netherlands-based Democratic Civic Union of Turkmenistan. The formal launch of a new pipeline taking Turkmen gas to China on December 14 was the culmination of a year in which this energy-rich Central Asian state has been actively seeking international investment. European states, in particular, are interested in Turkmenistan because it offers the possibility of accessing Central Asian gas without going through Russia as broker and supplier. One way of breaking Moscow’s stranglehold on gas supplies is the Nabucco pipeline, which is planned to run from eastern Turkey to southeast and then central Europe. To get Turkmen gas into this pipeline it would have to cross the Caspian Sea to Azerbaijan, which would be achieved by laying another pipeline along the bottom of the sea. The United States, too, is clearly interested in Turkmenistan as an energy supplier, as shown by visits paid by senior State Department officials to the country. With the door to dialogue ajar, Western governments have attempted to engage the Berdymuhammedov administration on broader issues. The Organisation for Security and Cooperation in Europe, OSCE, the European Commission, the United Nations Development Programme and the UN High Commissioner for Human Rights have increased their activity in the country. This includes projects related to human rights, implemented in cooperation with the Turkmen government. Human rights observers both inside the country and internationally warn that the dialogue on energy has done nothing to promote openness in other areas. In November, for example, the Norwegian Helsinki Committee issued an open letter jointly with Turkmen rights defenders, calling on western governments and institutions like the EU to pay greater attention to human rights. The same month, Global Witness, a London-based watchdog group that monitors the misuse of revenues from mineral resources, published a report entitled “All That Gas? 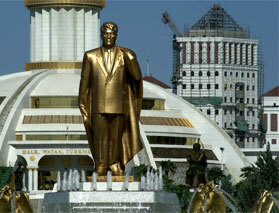 Five Reasons Why the European Union is Wrong to Bow to the Dictatorship of Turkmenistan”. One of the arguments made in the report was that the European Commission “thinks a softly-softly approach to Turkmenistan will reduce human rights abuses. but there’s little sign that it will”. NBCentralAsia’s own enquiries suggest that three years after the death of Niazov, there has been little change to any of the worst abuses for which he was responsible. Dissidents and independent journalists continue to be persecuted, freedom of movement remains severely limited, and fundamental political rights and freedoms remain just as distant a dream as they were in the Niazov years. There is considerable evidence to support Global Witness’s suggestion that the Turkmen authorities are deliberately calibrating their response to western concerns by offering concessions that can be held up as small victories, without moving an inch on the substantive issues. For example, when the authorities released one political prisoner, Muhametkuli Aymuradov, in May 2009, it did not herald an overall liberalisation, and no more were freed. Over the summer, current restrictions on freedom of movement – in the shape of a blacklist of “undesirables” – seemed to be tightened rather than relaxed when students were prevented from leaving the country to take up university places abroad. Like other commentators interviewed for this report, a media-watcher in northern Turkmenistan said western states ought to insist on democratic progress as a precondition for buying gas from the country, but acknowledged that this was unlikely to happen. “The West must not validate a dictator by buying gas or other resources from him; but instead give him to understand that gas purchases are based solely on the democratisation process and on improvements in the human rights situation,” he said. Annadurdy Khadjiev, a Turkmen economist living in Bulgaria, also believes it is important for western states and firms to ensure that economic agreements are tied to more general reforms. He believes that in the first couple of years of Berdymuhammedov’s rule, there was some hope that such mechanisms would be put in place and have some effect. Nowadays, he says, the impression is that Turkmenistan’s prospective partners would do anything “just to get hold of its gas”. A Turkmen diplomat, speaking on condition of anonymity, called on critics of the western policy of dialogue to show more patience. Change would come, he said, but it would take time. Another foreign ministry official offered a more jaundiced view of the West’s chances of “leveraging” change in this manner. A human rights activist inside Turkmenistan expressed concern that the international community would squander future opportunities for setting conditions. Inga Sikorskaya is IWPR’s senior editor for Turkmenistan and Uzbekistan, based in Bishkek.